It has been a rollercoaster week for Melbourne's latest superhero Michael Rogers to say the least. 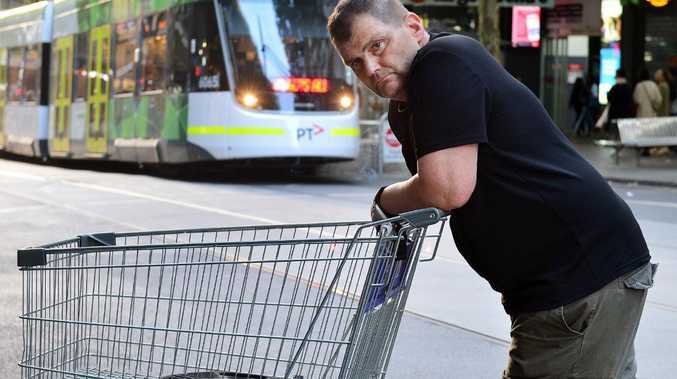 It was just five weeks ago that the homeless legend - who has come to be dubbed as the trolley man for his jihadi-fighting credentials - was released from jail for stealing a bike. Now he is slowly beginning to turn his life around after thousands of adoring fans have donated more than $136,000 in a charity fund to help him back on his feet. Last night, he began to see some of that money - which was raised through a GoFundMe page organised by the Melbourne Homeless Collective (MHA). The charity handed him $500, and with it he decided to buy a new phone. 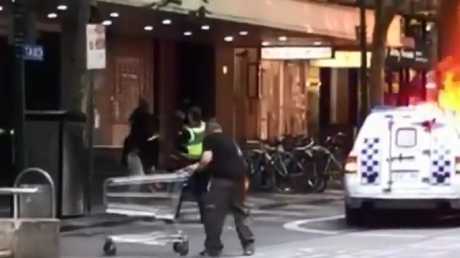 His old one was smashed when he was charging down Bourke Street terrorist Hassan Khalif Shire Ali with a shopping trolley on Friday. Once he's sorted that out, he tucked into a veritable feast of spaghetti marinara and pizza from his favourite restaurant La Porchetta. Responding to criticism of the fundraising effort, MHA founder and managing director Donna Stolzenberg has pledged to put the money in a trust for Mr Rogers, in an effort to ensure he doesn't blow it all at once or get taken advantage of. Once he's used the cash to change his life for the better, Mr Rogers told the Daily Mail he plans to give $15,000 to charity and share the wealth around. "I want to be a good guy," he told the publication. "I'm going to try anything to do the right thing because I just wanna get a place to settle in that I like, and set it up the way I want it." It's a dramatic turnaround for Mr Rogers who had been living in a commission home in Footscray with no power, no television and no internet. As he approached a knife-wielding terrorist on Friday, Mr Rogers said he "just wanted to help and do something right for the first time in my life". He said he spent years behind bars for burglary and had a long history of drug use, according to The Age. It's understood he has a public housing apartment but chooses to be homeless. Ms Stolzenberg said she was aware of Mr Rogers' criminal and drug history and will work to connect him with homeless services and ensure the money is used in ways that will not put him at risk. "All funds donated to this campaign will go directly to Mr Rogers to help get him back on his feet," the organisation's site reads. "He's a hero in our eyes and he can do what he feels best with any funds he receives. He risked his own life that day for nothing in return and you can't put a price on that." The charity has since expressed how blown away it is by everyone's generosity and "spirit in helping our hero 'Trolley man' get back on his feet". Despite becoming an overnight Aussie hero, not everyone thinks Mr Rogers' actions on that fateful Friday afternoon should be celebrated. Victorian Police's commissioner Graham Ashton, who told 3AW today that Mr Rogers' actions could have had potentially dangerous consequences. "I don't like to criticise people in that situation, he's acting instinctively about what he's looking at in front of him," Mr Ashton said. "But if a trolley had hit a police member and knocked him over and then this offender got on top of him, we could have had a tragic consequence. "I think he was trying to support the police in his own way, so I haven't been jumping on him over the weekend." Some detractors on Mr Rogers' GoFundMe have also expressed dismay at the plan to give him more than $136k. 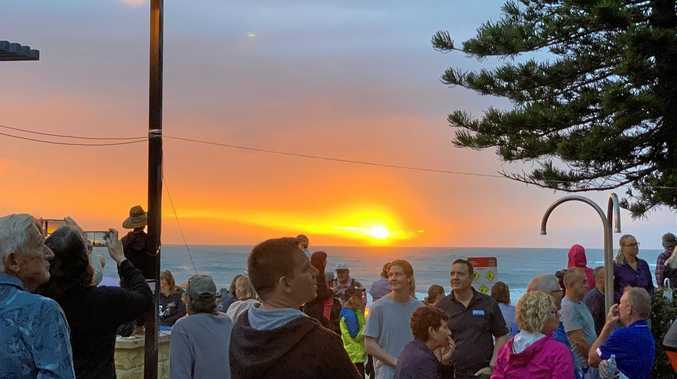 "I hate these things that raise money for a single individual well in excess of what is needed because it always comes at the expense of people giving generously elsewhere to address systemic problems that lead to the situations he was in the first place," wrote one commenter. "You don't fix homelessness (or this man's life actually) by throwing $50k at him personally."